September 2013 – Cooking with Gabi – all about integrating Fruits & Vegetables into your daily diet! Out of this World Whisky Cream Cheese Frosting! You read that right! What in the world was I thinking? After all, if you choose to make tomato-lemon cupcakes, what else would go well on top????? Had some Jimmy Beam hanging out in the fridge….so I thought…why not incorporate some whisky into a basic cream cheese frosting….and give it a pop of flavor? And me, oh MY! Talk about wild flavor profile…..and yes, if you look at it critically through an artistic perspective, you may think that I decided to put an egg on top of a cupcake, but no, alas, I have not gone down that road….YET! 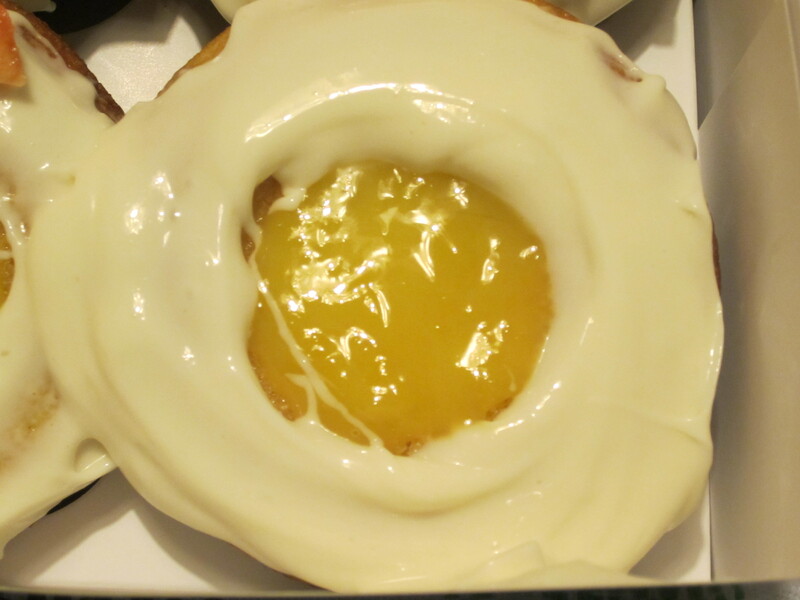 In the middle as the “yolk” is a tablespoon of home made lemon curd….so just imagine……a bite of creamy cream cheese spiked with whisky combined with the tart lemon curd, over a tomato-lemon cupcake! This is what happens when I get Creative In the Kitchen! 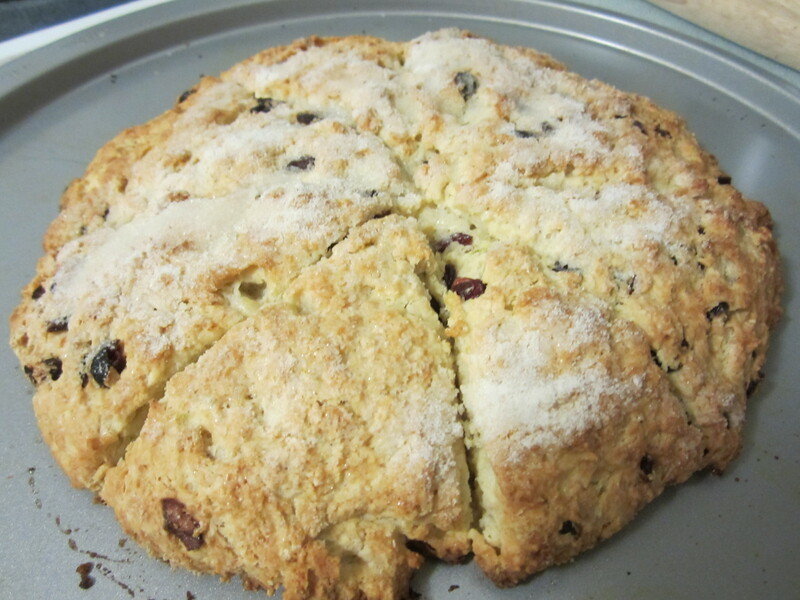 Simple, light and not super sweet…..that’s how I like my scones! In one bowl mix dry ingredients and whisk them together (the all purpose flour, salt, 2 tablespoons sugar and baking powder). With a pastry cutter or two knives, mix in the chopped unsalted butter into the dry ingredients until it is well incorporated. In a small bowl, whisk the egg with the milk and set aside. Zest the lemon and the lime and add that to the dry ingredients, whisking them throughout. Pour the milk and egg mixture into the dry ingredients, as well as one tablespoon of fresh lemon juice and the cranberries and mix well together. I used a pizza pan to spread out the dough once I kneaded it lightly and pressed out a circular shape and lightly made cuts on it – 8. This will bake for approximately 25 minutes in a 375 oven. Before placing in oven, sprinkle one tablespoon of sugar on top, as this will help to brown the top a bit. Scones are delicious with tea or coffee! It’s a great snack or breakfast item that you can incorporate into your daily diet, as they are not full of sugar, but they pack the flavor! I wanted something sweet….but not too sweet….I didn’t want chocolate….nor ice cream……my taste buds were asking for something semi tart….so I reached for the bag of lemons that I just bought the other day. But what would tame my desire for something sweet and sour? Decided to surf through the many cookbooks that I have and I came across one that made me drool….and so began my descent into Lemon Madness! What is it about lemons? Is it because I relate that amazing flavor with my Grandmother’s lemon tree that she had in her backyard…always flourishing with lemons as big as my hands? Is it because if you add just a little bit of any herb or sweetener the flavor becomes transformed into utter deliciousness? So let me get back to the recipe. If you enjoy sweet and sour, you must make these adorable tassies! Stir together the flour, the 1/3 cup sugar and 2 teaspoons of lemon peel (this became more towards one heaping tablespoon of lemon peel for what I made). Cut in the 1/2 cup butter (one stick of unsalted butter that I used) until mixture resembles coarse crumbs. I was still in workout mode, so I crushed this mixture together until it really did look like crumbs! In a small bowl combine the 1 egg yolk and the 2 tablespoons of cold water. Gradually stir egg yolk mixture into dry ingredients. Gently knead to form a ball. If necessary, cover and chill for 30 to 60 minutes or until dough is easy to handle. Now I found that the best way of doing this was to cut a large piece of plastic wrap on my kitchen counter, place all the ingredients in it and then form the dough into a ball and close off the plastic wrap, placing it in the refrigerator for at least a good half hour. While the dough hung out in the fridge, I went to work on the lemon filling, which to me ended up like a lemon curd. In a medium saucepan stir together the 2/3 cup sugar and cornstarch. Stir in 2 teaspoons of lemon peel, 1/2 cup lemon juice, 1/4 cup water, and 2 tablespoons of unsalted butter. Cook and stir over medium heat until thickened and bubbly. So where the recipe said “lemon juice” I took it to be fresh lemon juice….I ended up juicing 4 lemons….best way to get as much juice out of a lemon as possible is to place them in the microwave for about 15 seconds on high…..that way when you cut them, they will certainly be easier to squeeze out as much juice as possible. I also ended up using more cornstarch as it took a while for it to thicken…maybe it had to do with the fact that I had quite a bit of fresh lemon juice. In another bowl, place the 3 egg yolks and lightly beat them. Gradually stir about half of the hot lemon mixture into the 3 egg yolks. Return egg yolk mixture to saucepan. Bring this mixture to a gentle boil over medium heat; reduce heat. Cook and stir for 2 minutes (I cooked and stirred it for about 10 minutes). Transfer to a small bowl. cover surface with a plastic wrap; chill until needed. Now was the time to have fun with the dough…it had been chilling in the fridge for over half an hour, so by the time that I took it out, it had come together. I took out 3 pans for baby cupcakes, used Pam on them so that they would not stick and placed about one tablespoon of the dough into each opening, pressing them as evenly as I could to the bottom and sides of each tiny cup. Into a preheated oven at 475, they went to bake for approximately 10 minutes. By the time that I heard the kitchen timer go off, I was running to the oven…and that is when I realized that I should have left them in the oven for just 8 minutes or so, checking in on them, as some of them did get a little bit more on the brown side than the lightly “golden” color that the recipe said they would be! Took those 3 small pans and put them out to cool, but I couldn’t help but carefully and without burning my fingers, using a spoon, take one tassie out to give it a taste…and oh, My Goodness! I was so thankful that I had gone overboard with the lemon zest…..they were delish just by themselves….it tasted like a very light lemon cookie…..soooo delish. these could be used to serve Limoncello sorbet in them….or any other kind of jam that you may have readily available, but I admit that once they cooled, I took a spoonful of the lemon filling and placed it on the tassie……and the flavor explosion was Amazingly Delicious! This was so much better than the bacon chocolate cookies I made last week! 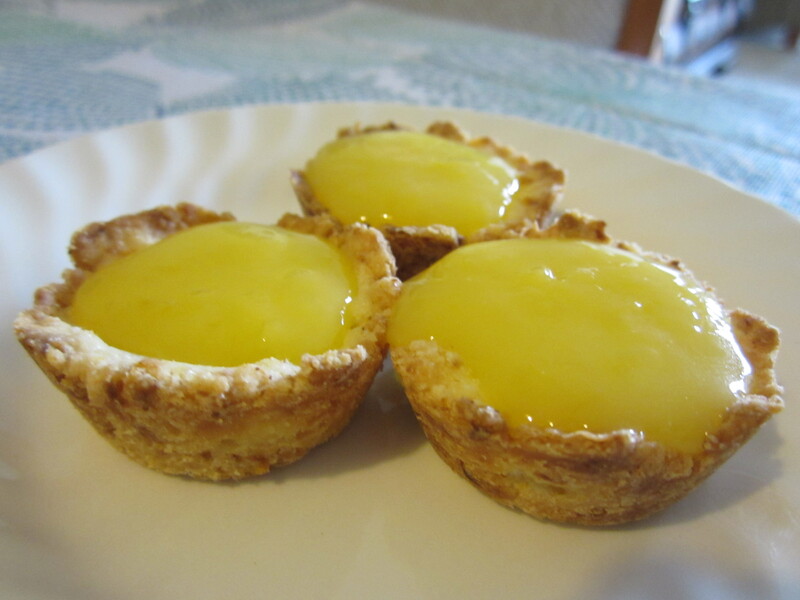 Lemon Tassies have now become my favorite dessert!